Over time, things evolve. Take cars, computers, rocket science, sports – they all improve performance, design, or complexity in some way. The same is true for men’s grooming. Perhaps no single area of men’s grooming is this truer of than the quintessential masculine ritual of shaving your beard. Today, shaving is both an art and science: an art in the craft of world-class razors and techniques that give closer shaves than ever before; and a science in the process and development of products used to minimize irritation, avoid razor burn, and leave your skin feeling and looking better than ever. Too often, guys avoid shaving because of the irritation, the hassle, and the fear that they may end up looking worse than they do with a little stubble. While stubble may be stylish under the right circumstances, you should know how to achieve the perfect shave when you need it. Whether for business or special occasions; your face is always the first thing people notice, and nothing says that you went the extra mile like a clean, crisp shave. If you are one of those guys whose avoided learning the right way to shave because you thought it wasn’t worth the effort, or if you are among those driven young professionals who want to look their best at every moment, we’ve put together an eight step guide to getting the perfect shave in the 21st century. As with anything you intend to do well, start by getting prepared to get down to work. This means you need to get your face and beard clean and ready to go. This way there won’t be dirt or debris to get in the way of the razor. Not only this, but soaking your facial hair in warm water softens it and opens pores to make lifting and cutting easier for your razor, which means fewer overall strokes and less irritated skin. In fact, the #1 cause of razor burn is simply not moisturizing the skin properly prior to shaving. How wet does your facial hair need to be? Your hair can absorb about 30% of its original volume in moisture. The more wet it is the easier it is to cut. So it’s best to give your facial hair several minutes to absorb moisture. The easiest way to do this is to shave after a shower. One last tip: you know how the barber wraps your face in a warm, wet towel prior to shaving? This is all about moisturizing the hair to make it easier to cut. So go ahead and give it a try at home. The first thing to learn about shaving creams is that, like all other products, not all are created equal. The more foamy a cream is (think aerosol can), the less lather it creates and the less protection it offers. it’s mostly just a bunch of air. The best shaving creams have extremely high amounts of lubricants and moisturizers so that they make a rich, heavy, creamy (not foamy) lather. With a high-quality shaving cream that creates a rich lather like this, your skin will be lubricated so that the razor slides right over it – protecting both your skin and the razor. Shaving cream also helps your facial hair and whiskers from drying out as you shave. It’s best to apply your lather about a minute before shaving so that it has time to soften up your hair as much as possible. Don’t know what your shaving brush is? If you bought a high quality razor or grooming set, you likely have one in there somewhere. If not, it’s time to go out and get one. Why? A shaving brush helps you make your hair “stand up” or “stick out” so that you can get as close of a shave as possible (without going against the grain – more on this later). A shaving brush makes creating and applying the perfect creamy lather as close as possible to the skin easy and less messy. A shaving brush helps to exfoliate your facial skin – that is, remove the dead cells that can cause nicks and bumps as you shave which reduces resistance for a closer shave. What kind of brush should you get? It’s best to find one that has firm bristles that are still somewhat soft. If the bristles are too soft, they won’t be able to create a creamy lather or help the hairs stand up. If they’re too hard, they’ll cause irritation instead of help soothe. When it comes time to apply your lather with your shaving brush, always swirl the brush circularly ending with an upward lift to help ensure your facial hairs are “lifted” instead of “pressed down.” This may take a bit of practice, but if you watch your results in the mirror, you’ll soon master this technique. You can soften your facial hair all you want and prime it with the richest lather and best brush – but none of it will matter if you settle for a poorly designed razor with cheap or dull blades. If there’s one thing you learn from this and nothing else, let it be this: always use a sharp razor. Dull blades can hurt your skin and cause nicks, cuts, or razor burn – leaving blotchy, patchy looking skin. So as soon as a blade starts to dull, sharpen or replace it. When it comes to picking out the right razor – you will want to look around. There are many options out there with new men’s grooming companies popping up all the time. If you are just going to your local department store, you’ll want to look on the high-end of things. In general, the current Gillette Mach Razor or competitor equivalent with several blades are best. But our recommendation is to find a boutique shop that you like. The quality is often far better than anything on the mass market as is the price – not to mention the customer service. How often should you change your blades? This really depends on the guy. If your beard is on the rough side, you may need to change blades even as often as every 3 – 4 shaves. Other guys may find they can get as many as 8 shaves out of a razor, but if you are using the same razor to shave every day for more than two weeks, this is way too long. Do your skin a favor and start changing blades every 2 weeks no matter what. Start at the sides where facial hair is typically the softest and shave in the direction of the beard growth. Next work on the upper lip and mustache where hair is a bit rougher and needs more time to soften. Finish by shaving your chin where the hairs are the toughest. Leaving this till last lets these hairs soften as much as possible before you begin. It’s the quickest way possible to ruin a perfect shave with a nick or a cut. Simply put – the risk is often far greater than the reward. Sometimes you cut hair off so close, it’s below the skin level which can lead to ingrown hairs which appear as angry red bumps. Not sure which direction your hair grows on a certain part of your face? You’re not alone. Everyone’s face and beard is a little different. The best way to learn how your hair grows is to let it grow out for a few days. The longer it is, the more apparent the direction it is growing in will be. One final tip about using your razor: let it do the work for you. Shaving your beard requires no “elbow grease.” Don’t press down, don’t try to force it, let the razor glide and you’ll avoid irritation. If you are a guy who gets a lot of razor burn and bumps, there’s a very good chance that this is your problem, so try not pressing so hard and see how your skin looks and feels after your next shave. So if you can’t shave against the grain, how can you ensure a close shave? Your skin will be far better off if you simply re-moisten, re-lather, and once again, re-shave in the direction your beard grows. Re-moisten your face to make it easier to shave on the second pass. 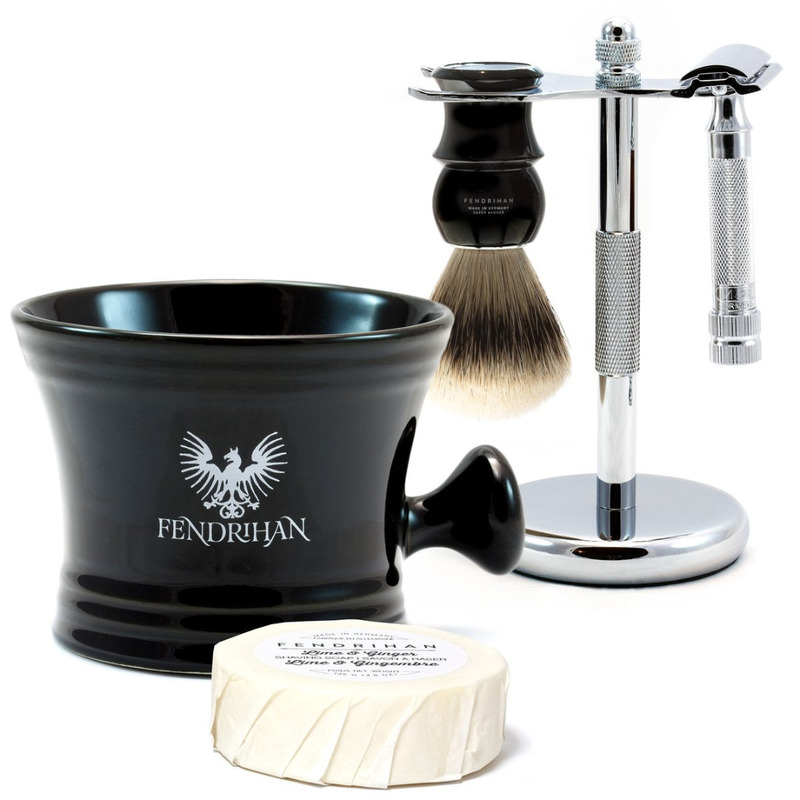 Using a shaving brush is a great way to help maximize the effectiveness of this method. Hairs that were buried the first time and didn’t stand up are much easier to prepare with a brush on a second lather. You may be tempted to try to go “sideways” like you may have seen professional barbers do. However – don’t. Simply put, this is a pro technique and you’re far, far more likely to cut yourself or get a bad case of razor burn doing this at home. After your shave, don’t forget to rinse the blade to clean it of any debris that may impair its ability to glide next time. This is far easier to do while the blade is still wet. You may be tempted to dry off the blade with a towel, but avoid doing this and instead let it drip dry as a towel will only dull it faster. This step is easy, but necessary. The key here is that your skin is never more vulnerable than it is immediately following a shave. Therefore, to protect it, make sure to rinse it with warm water. Then, wash your face with a cleanser that has natural ingredients and therapeutic oils. We like tea tree and coconut oil for adding moisture and nutrients. Coconut oil keeps skin soft & smooth while green, white, and rooibos tea add powerful antioxidants. Pro Tip: Look for a cleanser with activated charcoal for the best way to get a deep clean. It acts like a magnet, attracting and absorbing dirt and oil. When dirt and oil come in contact with the charcoal, they stick to it and get washed away with dead skin when you rinse. Leaving a smoother, brighter complexion. Rinse again after washing and then pat dry. It’s important not to rub with the towel as this will remove the nutrients you just replenished. When you are done rinsing after your facial cleanse, it’s time to put some moisturizer on your skin. 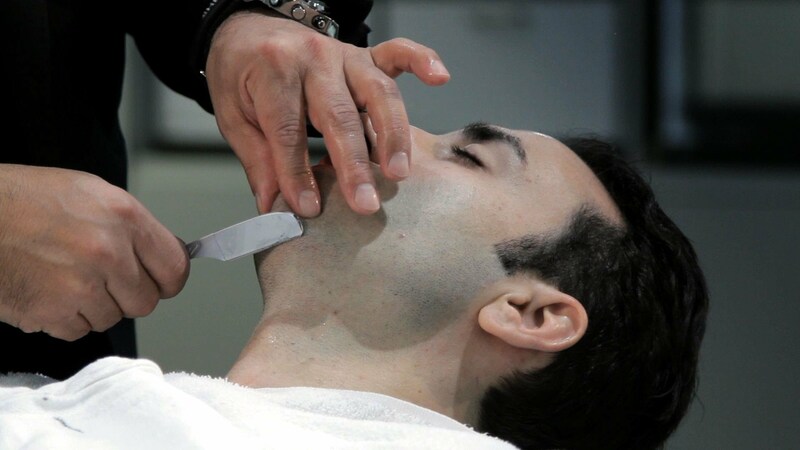 Most guys don’t think about the fact that they’ve removed 2 – 3 layers of skin while shaving. Name one other activity you do every day that does this. Hard to think of, isn’t it? Aftershave lotions and moisturizers exist for a very good reason – they replace moisture and soothe the irritation of having skin removed. This is a key area when guys need to stick to For Men products. Lotions and facial moisturizers designed for women aren’t built to help replenish and protect from the abrasive process of shaving. Aftershave facial moisturizers and lotions for men are developed to be less greasy, absorb as quickly as possible, and dry with a non-shiny, matte appearance. Look for a moisturizer with Vitamin E, which provides antioxidants and shields your face against the environment. Beyond this, look for an after shave that also refreshes and cools your skin down to leave you looking and feeling your best after your perfect shave.